Ajee’ Wilson was born May 8, 1994 in Neptune. She was one of four kids, all relentlessly upbeat and competitive. Initially, Ajee’ was drawn to sports with lots of running, including basketball and soccer. Her favorite part of soccer practice was the team’s 1,000-yard run. Her younger sister, coaxed her into joining the Jersey Shore Track Club at age 9. The Wilsons chauffeured their kids to USTAF and AAU age events throughout the region and soon Ajee’ distinguished herself as a dominant middle- and long-distance runner, often beating older and more experienced runners. By the time she entered high school, she was a veteran of Junior Olympic competition. Ajee’ continued to improve running for the Academy of Allied Health & Science, a county magnet school located in Neptune. In 2011, Ajee’ won gold medals in the 800 meters at the World Youth Championships in France. Shortly after graduation, she tried to make the Olympic team and failed, but took gold at the World Junior Championships in Spain. Ajee’ planned to attend Florida State on a track scholarship but decided in August to turn pro instead, thanks to a generous offer from Adidas. She continued to train with longtime coach Derek Thompson, who ran a track club in Philadelphia. In 2013, Ajee’ ran the 800 at the World Championship in Moscow and finished sixth—higher than any junior runner—and also won gold in the 800 at US Indoor Track & Field Championships. Ajee’ threw it into another gear after that. 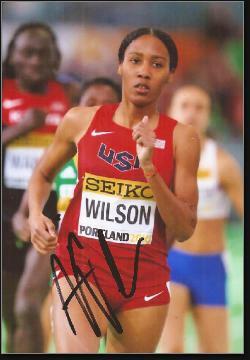 She won gold again at the US Indoors in 2014 and captured the Outdoor championship in Sacramento. At a meet in Monaco she ran the 800 in 1:57.67—the fastest time in the world that season. Ajee’ was also a member of Team USA at the 2014 and 2015 IAAF World Relay Championships. She won gold in the 4 x 800 in 2014 and was a member of a record-smashing distance relay effort the following year, along with Treniere Moser, Shannon Rowbury and Sanya Richards-Ross. Ajee’ got off to a fast start in 2016, winning gold at the US Indoors in the 800. At the Olympic Trials in July, she finished second to Kate Grace to make the U.S. track team in Rio. Ajee’ qualified for the 800 semifinals and ran an excellent race. The top two runners automatically qualified for the finals. Ajee’ finished third, inches behind Francine Niyonsaba of Burudni. She then watched as Niyonsaba won the silver medal in the finals.